Bob Baffert's Irish-bred Plein Air is back to defend her title in Sunday's Grade III, $100,000 Astra Stakes at Santa Anita, as she, along with Ray Bell's Mantuana and Jim Cassidy's Amboseli, head a wide open field of 10 fillies and mares going a marathon mile and one half on turf. In what was her U.S. debut, Plein Air was an impressive gate to wire winner of the 2018 Astra, which was subsequently upgraded to Grade III status. Winless in two subsequent starts, the 5-year-old mare comes into Sunday's Astra on the heels of six month freshening, which is just how she approached last year's running. Claimed three starts back out of a $40,000 claiming win at 1 3/8 miles on turf Aug. 22, India Mantuana could prove a menacing obstacle to Plein Air, as she exits a sharp gate to wire score in the marathon Grade III Red Carpet Handicap going 1 3/8 miles on grass at Del Mar Nov. 22. D P Racing's Amboseli, although winless in her last 16 starts, has kept good company and is best suited as a deep closer, a style that might fit well given the running styles of the top two. 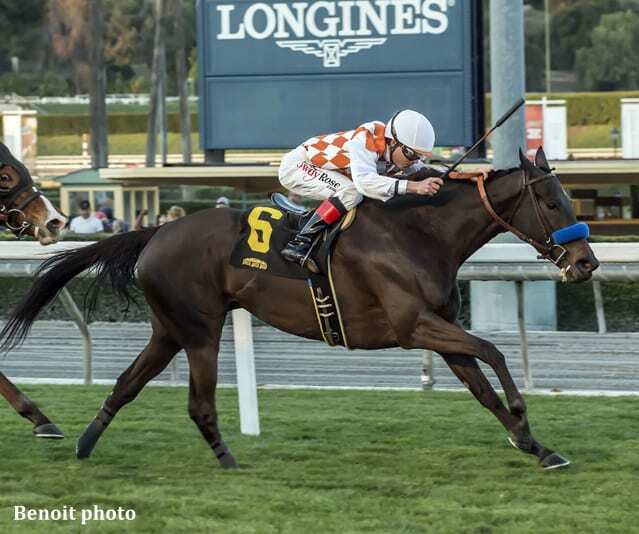 Off at 7-1 in her U.S. debut with Tyler Baze, she was then favored in her next two turf starts, a fifth place finish in the Grade III Santa Barbara Stakes at 1 ½ miles April 28 and in the ungraded Possibly Perfect, at a mile and one quarter on June 3. With Drayden Van Dyke set to ride for the first time, look for Plein Air to bounce back to good form and be forwardly placed on Sunday. Ridden by Tyler Baze in his last three starts, this 5-year-old Kentucky-bred mare by Wilburn has responded with a pair of front-running wins. In her Red Carpet triumph, India Mantuana, who was off at 18-1, opened up by six lengths after the first half mile and held sway late by a half-length going 1 3/8 miles on turf. Unlike many others in the Astra lineup, India Mantuana has won a good percentage of her lifetime starts, evidenced by her overall mark of 24-6-2-4. Her primary obstacles on Sunday would appear to be Plein Air and K P Pergoliscious, who've both done their best running when on the lead. Although she has but two wins from 25 lifetime starts, this 7-year-old Maddalia d'Oro mare has a dependable come from behind style, which could make her extra dangerous in a lineup that includes three speedsters such as Plein Air, India Mantuana and K P Pergoliscious. Most recently fifth, beaten 3 ½ lengths by highly regarded Fahan Mura in the Grade III Robert J. Frankel at 1 1/8 miles on turf Dec. 29, look for Amboseli to be much further back early in the Astra as Kent Desormeaux tries to time her late run just right. This entry was posted in Racing and tagged astra stakes, Bob Baffert, california horse racing, drayden van dyke, plein air, santa anita park by Mike Willman/Santa Anita. Bookmark the permalink.